Without much doubt, the selfie craze has touched everybody who owns a smartphone! In case you are not satisfied with the selfie stick brouhaha, Coca Cola has something in stock for all soda selfie lovers… Coca-cola selfie bottle. In an effort to stay relevant with drinkers of all ages, the soda-maker has introduced a new “selfie bottle” that automatically takes photos while you drink. The company attached a camera-equipped base to a 500 ml Coke to create what it calls the "world's first selfie bottle." It automatically takes photos when it detects a 70-degree tilt, and you can transfer photos through its USB port. The photos can then instantly be shared on Instagram, Facebook and Snapchat. 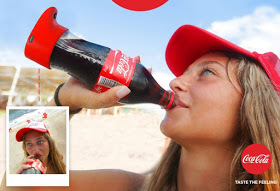 The “Selfie Bottle” has been devised by Gefen Team for the Coca-Cola as part of its Summer love outdoor festival in Israel. But no word yet on whether Coke plans to spread to sipping selfie love around the globe.